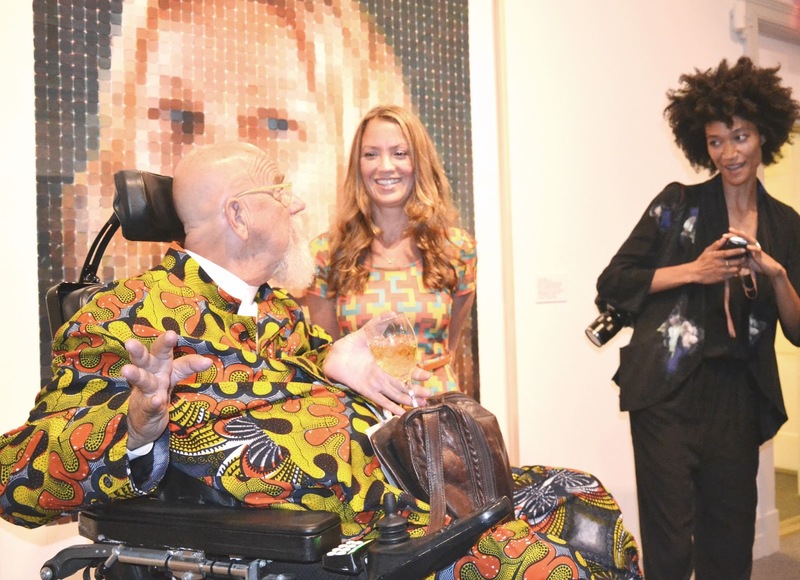 Artist and writer Mike Solomon offers a considered and appreciative assessment of Chuck Close's current exhibition at Guild Hall in his review for Hamptons Art Hub. Other works in the east gallery at Guild Hall show how Close has confronted the newest of media challenges, digital printing, which has since its inception revolutionized the art world. His archival watercolor pigment prints — large portraits of Cindy, 2012, Kiki, 2012, Cecily, 2012, and Zhang I, 2012 — are among the most sumptuous of his works I have ever seen. Playing with the techniques of watercolor, in which tonalities are made when light penetrates the medium and then reflects back to the eye, carrying with it the color and tone the medium has bestowed, Close brings to bear in these absolutely gorgeous works all the associations a viewer might have about watercolors. There are echoes here of Cezanne, Turner, Homer and Klee. 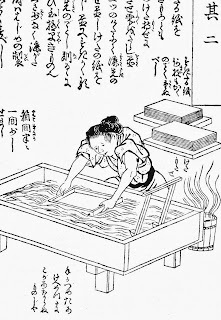 Through the computer, he is able to assign tinted values in each square of the grid and, I suspect, to print these “washes” in layers, through multiple passes, to arrive at the tones he wants. Through this technology, he achieves the same effects earlier artists developed manually, with a brush. The use of the digital domain to reinvent watercolor is the kind of thing many in the art world hoped for when the digital revolution started, but there have been too few examples of this kind of innovation. These works certainly change all that. I suspect an entirely new genre of watercolor painting will be derived from them. They are that important. 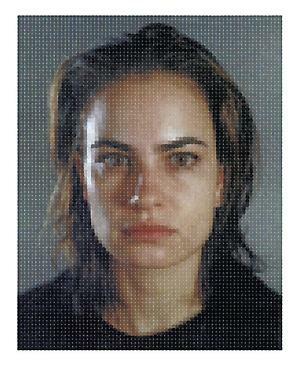 Notice the size of the grid, too, as its variation determines the kind of focus the viewer experiences of the image. 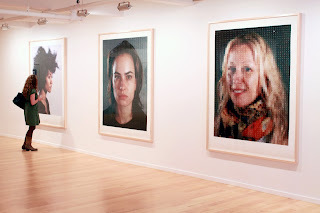 In Cindy, 2012, the grid size is about one and half inches, so the abstraction of the work dominates until the viewer moves back quite a distance from the surface. 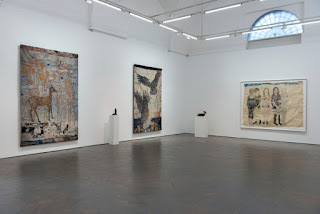 Cecily, 2012, has an even larger grid of about two inches, so the “immediate splendor” (Alfonso Ossorio’s wonderful phrase) is what the viewer gets from its abstraction until moving to the opposite side of the gallery. Then the representation finally comes into focus. In Kiki, 2012 and Zhang I, 2012, the grid is smaller, about three quarters of an inch. In these two, the images are tighter and the focus moves closer to the surface of the work. This choice of grid size is another one of those areas that Close plays with, and it begs, along with the beauty of the watercolor tints, the kind of contemplation that keeps one involved in the work. 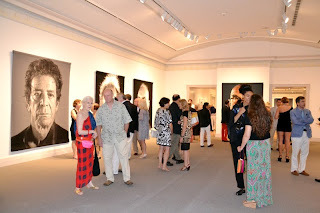 To read the full review, please visit the Hamptons Art Hub website. Following up on our earlier coverage of Chuck Close's VIP opening at Guild Hall come these candid shots, courtesy of Hamptons Art Hub; all photos below by Pat Rogers. 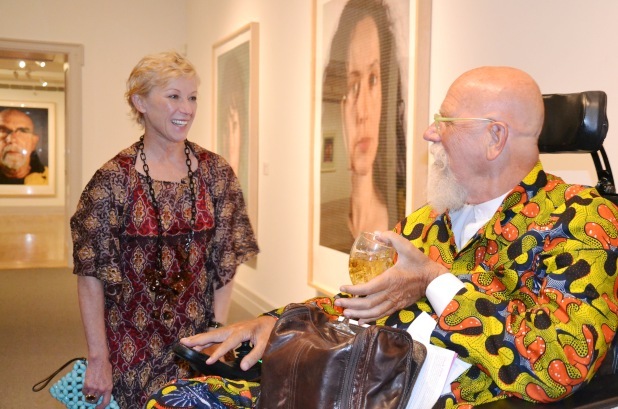 “Chuck Close: Recent Works” continues through October 14. 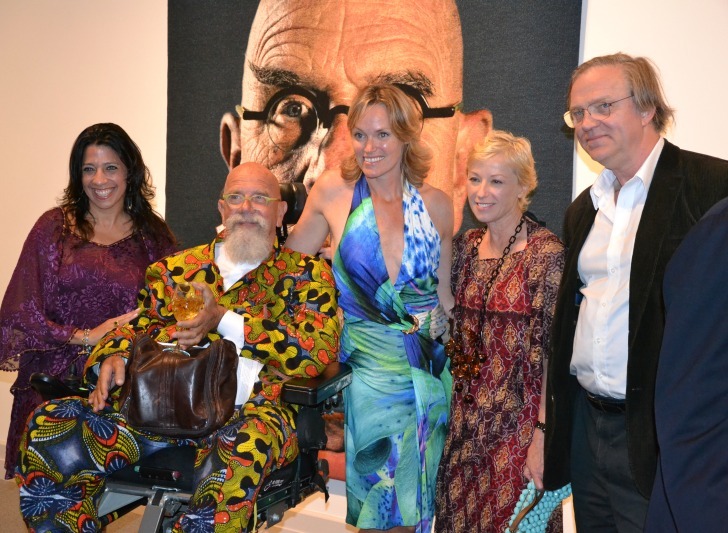 Guild Hall is located at 158 Main Street, East Hampton, New York; for visiting information please check their website. 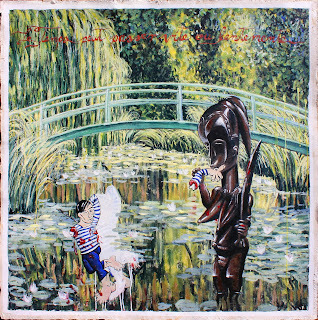 All of the artworks pictured can be seen in detail on Magnolia Editions' website. Chuck Close, art dealer Beth McNeill Muhs, and artist/model Sienna Shields with Close's 2012 print Cindy (smile), printed and published by Magnolia Editions. 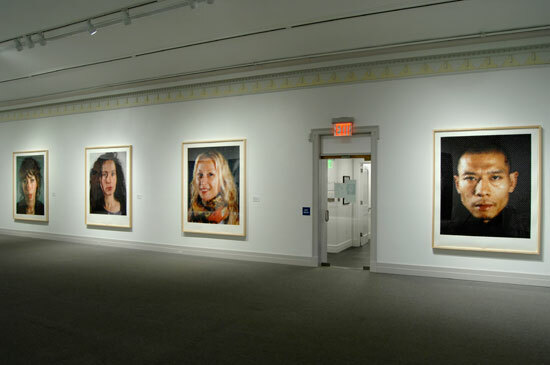 Artist Cindy Sherman and Close in front of watercolor prints from Magnolia including Self-Portrait (Yellow Raincoat), 2013, and Kiki, 2012. 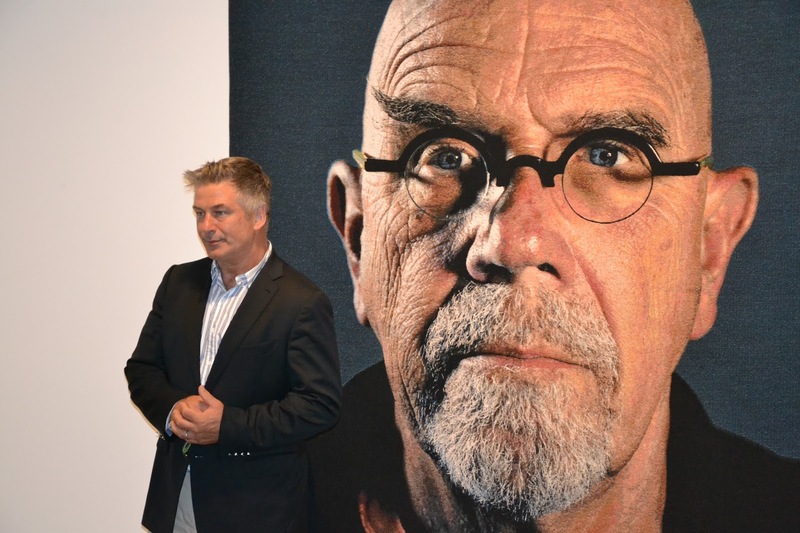 Actor Alec Baldwin with Close's 2013 Self-Portrait (Pink T-shirt) tapestry, published by Magnolia Editions. 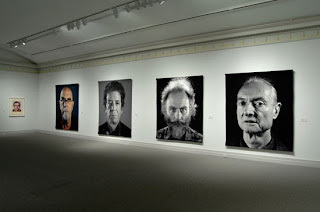 Tapestries by Chuck Close including Lou, a 2012 portrait of Lou Reed, at Guild Hall. Lou Reed himself at the opening. Chuck Close, Cindy Sherman, Robert Storr, and others pose in front of Close's 2013 Self-Portrait (Pink T-shirt) tapestry. 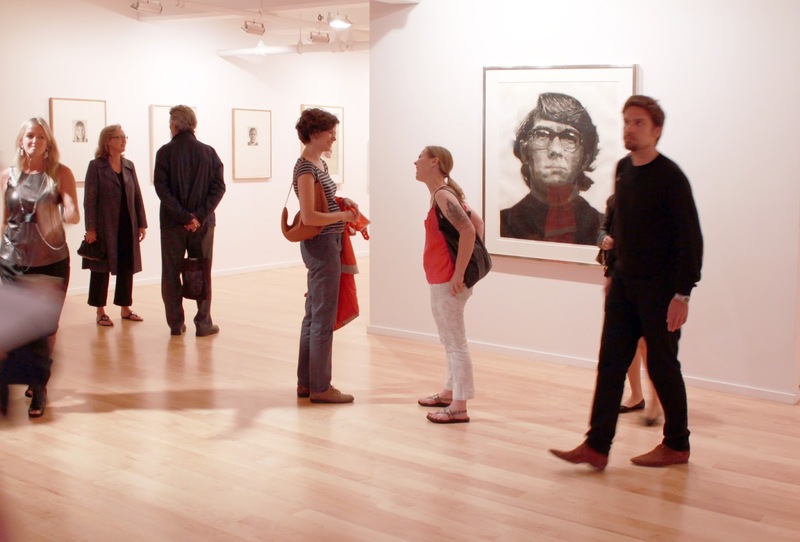 This exhibition focuses on several bodies of Close’s extensive oeuvre: rare drawings from the 1970s, important early prints, Polaroid maquettes, and two bodies of recent work, watercolor prints and felt hand stamps. 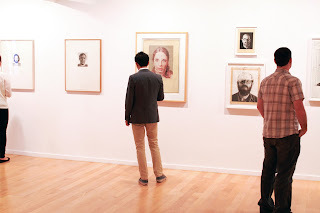 Stephanie Wright Hession of the San Francisco Chronicle writes that the show reflects Close's "adventurous nature" as an artist; visit the SFGate website to read her interview with Close regarding the inspiration and methods behind the portraits being exhibited. The watercolor prints in "Important Works on Paper" were printed and published by Magnolia Editions. The exhibition also provides an opportunity to see the debut of a project Close and Magnolia have been proofing for several years involving an innovative ceramic tile technique. 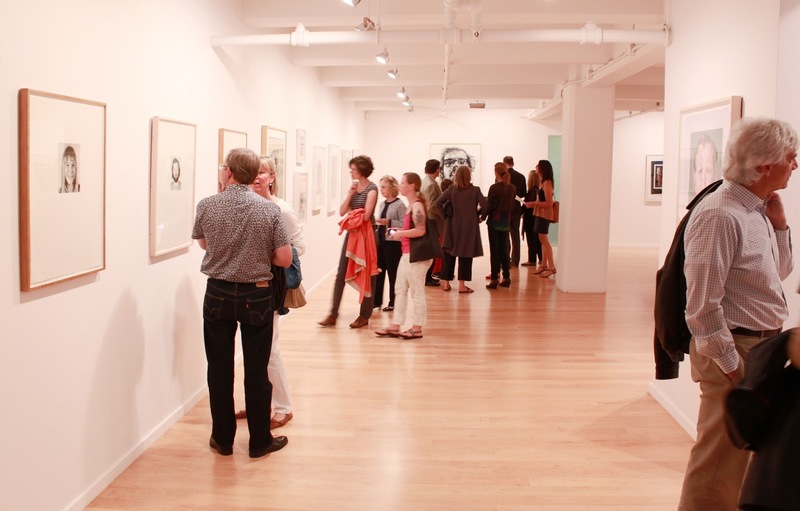 "Important Works on Paper" will be on view through November 2, 2013; please check the Berggruen Gallery website for more information. 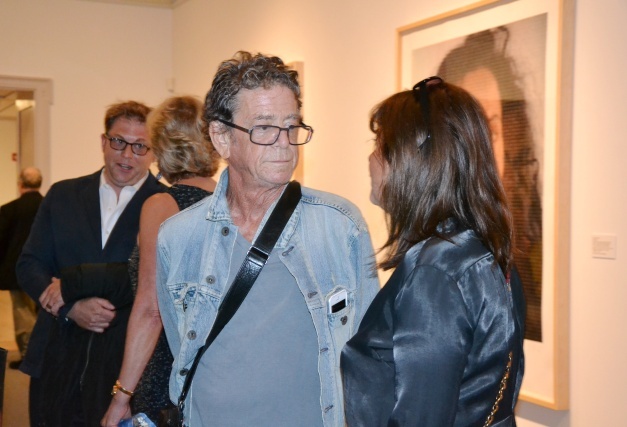 "Chuck Close: Important Works on Paper from the Past Forty Years" opens tonight at John Berggruen Gallery in San Francisco from 5:30 – 7:30 PM. 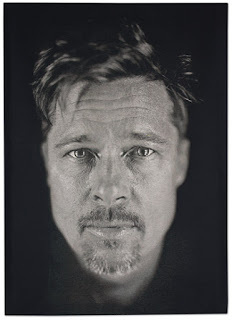 The watercolor prints in "Important Works on Paper" were printed and published by Magnolia Editions; the exhibition also provides an opportunity to see Close's well-known tapestry portrait of Brad Pitt, as well as the debut of a project Close and Magnolia have been proofing for several years involving an innovative ceramic tile technique. 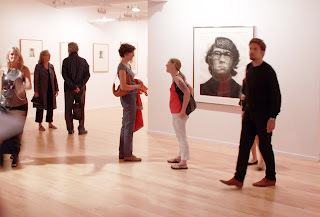 This exhibition focuses on several bodies of Close’s extensive oeuvre: rare drawings from the 1970s, important early prints, Polaroid maquettes, and two bodies of recent work, watercolor prints and felt hand stamps... 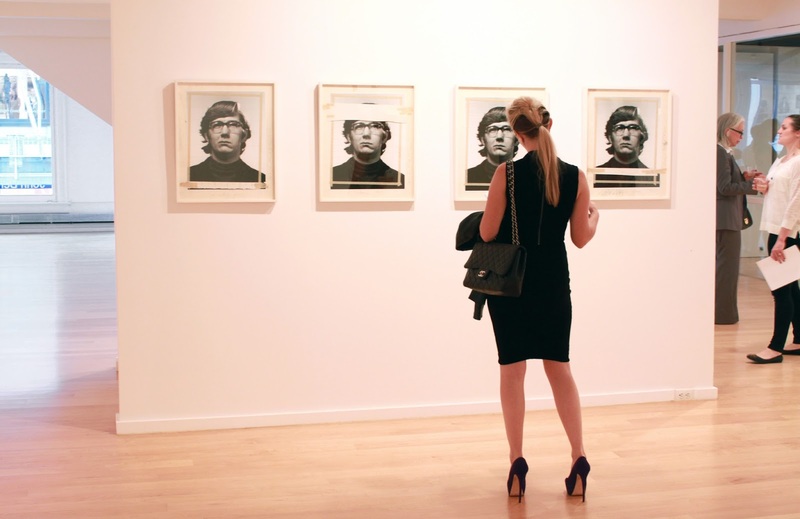 Among the highlights of Chuck Close include an impression of Close’s first print of his career, Keith, which he produced at Crown Point Press, here in San Francisco, in 1972. Other highlights include three drawings from the 1970s whose intimate scale demonstrate both Close’s technical mastery as well as express the conceptual foundations of his grid-based compositions. Close’s relationship to photography and the historical innovation inherent in its usage is explored in Self-Portrait (Maquette) as the viewer witnesses the beginning of what will become a visual relationship between technology (the Polaroid) and painting. The watercolor prints and felt hand stamps each introduce a new technique; together, the two create a new conversation between the digital and the analogue, between the human and the mechanical. This show marks the artist’s second solo exhibition at the gallery and the first since 1999, and will be on view through November 2, 2013. We hope to see you at the opening reception tonight! acrylic on canvas, 24 x 36 in. 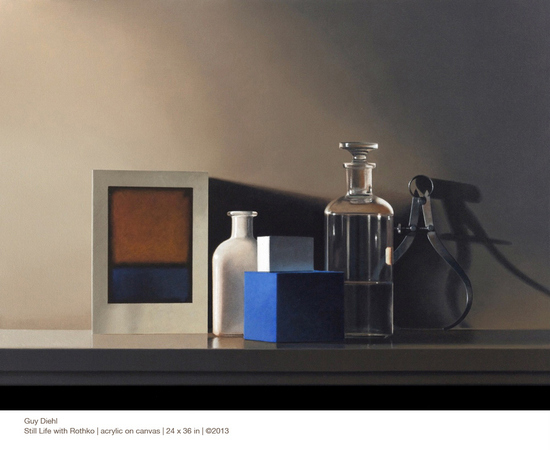 Bay Area still life master Guy Diehl, who has been publishing prints and tapestries with Magnolia since the late 1980s, was recently interviewed by Huffington Post arts blogger John Seed on the occasion of his upcoming show at Dolby Chadwick Gallery in San Francisco. In this in-depth conversation, Diehl discusses his background, becoming an artist as a means to harness his dyslexia as a strength, and the diverse intents behind his work in various media from painting, printmaking, and mixed-media multiples to murals and tapestries. 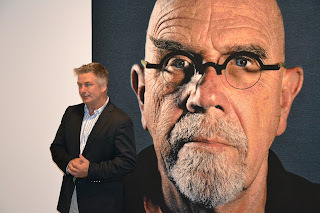 Please have a look at the interview over at the Huffington Post and don't miss "Guy Diehl: A Dialogue with Tradition," on view at Dolby Chadwick Gallery from September 5 - 28, 2013 with an opening reception on Thursday the 5th from 5:30-7:30 PM.